Ryan Hunter-Reay sped past leader Will Power, who scooted of the track with about and hour and 16 minutes to go, and went on to win Sunday’s IndyCar Series race at Barber Motorsports Park in Birmingham, Ala. 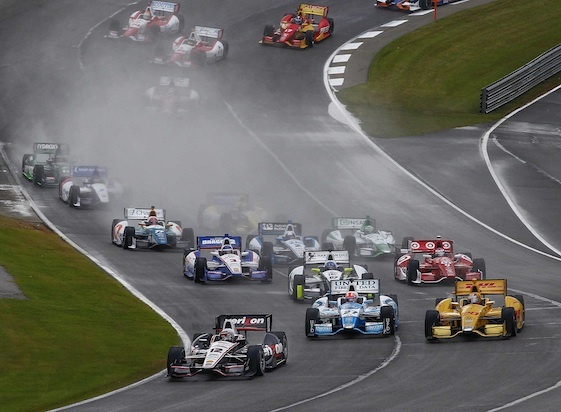 The win was the second straight at the Barber road course for the Andretti Autosport driver. Sunday’s was Hunter-Reay’s ninth win with Andretti Autosport and he extends his distinction of being the winningest active American driver in the Verizon IndyCar Series and the first American driver to visit victory lane in 2014. His previous Verizon IndyCar Series victories were: Milwaukee IndyFest (2013/Andretti Autosport), Barber Motorsports Park (2013/Andretti Autosport), Baltimore (2012/Andretti Autosport), Toronto (2012/Andretti Autosport), Iowa (2012/Andretti Autosport), Milwaukee (2012/Andretti Autosport), New Hampshire (2011/Andretti Autosport), Long Beach (2010/Andretti Autosport) and Watkins Glen (2008/Rahal Letterman Racing). He also has victories in the CART/Champ Car Series at Milwaukee (2004) and Surfer’s Paradise (2003). Hunter-Reay is the only driver to score victories in the IndyCar Series, CART, Champ Car, Grand-Am and the American Le Mans series. Teammate Marco Andretti finished second in the race, which was held on a damp track, while Scott Dixon of Chip Ganassi Racing was third. Simon Pagenaud, who had started 10th, finished fourth. Team Penske’s Power, who started from the pole position, was fifth. Power was able to hang onto his points lead with his finish. Point Standings: Power 125, Hunter-Reay 107, Pagenaud 92, Dixon 87, Conway 82, Andretti 73, Wilson 67, Castroneves 66, Kanaan 62, Newgarden 58.